Two sites of ruins and a cenote make this the most complete Mayan adventure we offer. Explore Chichen Itza, one of the New 7 Wonders of the World, then stop for a refreshing swim in the cenote and buffet lunch. Our last stop takes you to Ek Balam pyramids to climb to the top of the ruins. Available from Cancun, Puerto Morelos & Playa Paraiso. Buffet lunch including salads, rice and beans, grilled fish, chicken, pork loin in a classic Mayan sauce, beef tips, fettuccini primavera, fresh fruit, desserts and tea or coffee. Does not include tip or other drinks. Does not include tips, other drinks, guide in Chichen-Itza, guide in Ek Balam (Optional, 800 pesos ~ approx $75 USD at each site for a 90 minute guided tour). This tour is for folks staying north of Playa del Carmen including Cancun, Baha Petempich, Puerto Morelos & Playa Paraiso. If you are staying in Playa del Carmen, Puerto Aventuras, Akumal or Tulum, it is better for you to book the Chichen Itza, Ik Kil & Coba Ruins tour. Itinerary: Drive time from Cancun is 2.5 hours. I suggest a 7 AM - 8 AM departure. Spend 2-3 hours in Chichen Itza, then go for lunch and to swim in the cenote. 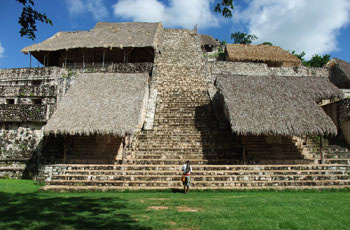 Next go to Ek Balam where you can climb to the top of the pyramid. Pack for this tour: Sunblock, sunglasses, hat, bottle of water, camera, towel & swimsuit.